The best PDF to Image Converter to convert PDF to JPG pictures. If you want to extract an image from PDF or save the PDF as images for backup. 3herosoft PDF to Image Converter for Mac will be excellent to convert PDF files to lots of images files in high quality, such as convert PDF to JPG, PDF to GIF, PDF to TIFF, PNG, BMP, PCX, TGA and so on. 3herosoft PDF to Image Converter for Mac is also an easy-to-use Mac PDF image extractor, created specifically for Mac OS user to extract images from Adobe PDF files and then convert the extracted images to popular image formats includes TIFF, JPG, PNG, GIF and BMP. Before you convert the PDF to Images files, 3herosoft PDF to Image Converter for Mac also helps you to choose the page range to select all pages, current page and your self-defined pages. All your PDF pages can be viewed on the preview window. Free download this best PDF to Image Converter and get image files with different formats, and view PDF files as image slide on your Mac computer. Converter supports all common format images including JPEG, TIFF, BMP, GIF, PNG, EMF and various others. PDF To Image is an advanced converter to generate high resolution images or multi frame Tiff images. PDF To Image Converter accurately converts various PDF documents to distinct images swiftly in few steps. PDF to Image application switches number of single or multi-page PDF files in distinguished format images. Converter is ideal tool to convert password protected PDF documents having multiple pages to specific format images such as jpeg or other images along with defined settings. At times you need to convert only selected pages of your document. In this scenario, you don’t need to convert the complete document. 3herosoft PDF to Image Converter for Mac allows partial document conversion. Specify the pages or page range for conversion and the tool will convert the document accordingly. 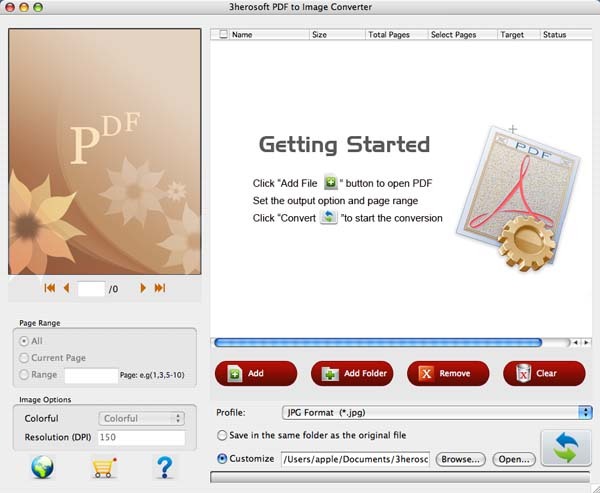 3herosoft PDF to Image Converter for Mac can convert PDFs generated through any application into Image. This makes this tool quite versatile. How to convert PDF to JPG/BMP/PNG/TGA image files?